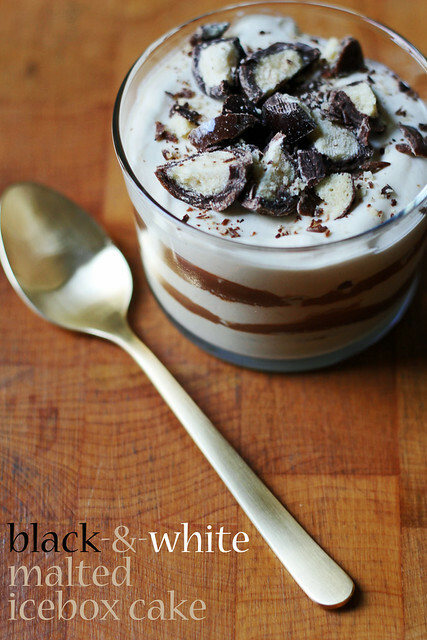 Black-and-White Malted Icebox Cake and a BOOK GIVEAWAY! Now that the days are getting warm– maybe even borderline hot– wouldn’t it be nice to just reach in the fridge and pull out a cool, creamy dessert that practically made itself? That exists…it’s called an icebox cake! At its most simple and familiar, an icebox cake is just store-bought wafer cookies and sweet whipped cream, stacked in alternating layers and left to meld in the refrigerator (or icebox– my dad actually calls it that, by the way) for several hours. The cookies absorb moisture from the cream and soften during the rest, and what you get afterward is a rich, creamy dessert that falls somewhere between pudding and cake. You can imagine that you can take this basic, yet brilliant, idea in a lot of interesting and delicious directions…like my friend and former co-worker Jessie Sheehan, who, along with her co-author Jean Sagendorph, just published a super-fun (and super pretty) new cookbook called Icebox Cakes: Recipes for the Coolest Cakes in Town. They have the basic “old school” covered, of course, and recipes for 24 other awesome-sounding icebox cakes. Espresso-chip– hello! Chai-ginger– whaat? And OMG– a black-and-white malted. That’s the first one I decided to try. You need four main components for this malt shop-inspired treat: whipped cream flavored with malt powder (super easy), milk chocolate ganache (super easy), vanilla wafer cookies (not hard to make yourself, but super easy if you choose to buy them instead) and time (the hardest part!). 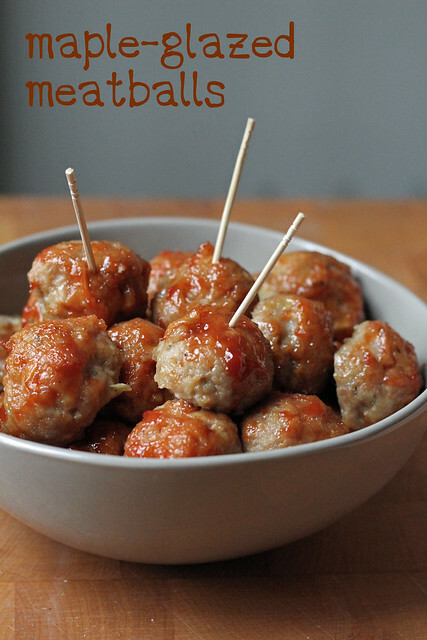 Oh, and some chopped malt balls scattered over top will make it extra pretty– let’s not forget that! You just alternate layers of the cream, cookies and ganache in a springform pan and you’re ready to refrigerate. If you’ve used store-bought cookies, you can get away with just 5-8 hour chill, but if you’ve made your own cookies, you’ll need a full 24 hours in the fridge for them to properly soften. You can see I took a little artistic liberty and divided the components into individual-sized mini icebox cakes instead of a full 9″ springform. Go find the full recipe for the Black-and-White Malted Icebox Cake on Jessie’s blog…and know that you can use shop-bought vanilla wafers (like Nabisco or Keebler) if you don’t have the desire or time to make your own. It’s rich, creamy, malty, sticky and delicious, and when you see this black-and-white zebra striped beauty waiting for you on the icebox shelf, you’ll be very happy you put it together the night before. Jessie says it’s a crowd-pleaser, and I can’t argue with that. 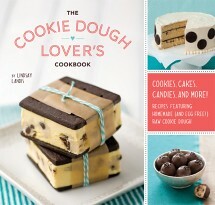 I’m so excited about Icebox Cakes: Recipes for the Coolest Cakes in Town that I want to send a copy to one of you! A signed copy at that! Just leave me a comment (one per person, please) on this post before 5:00 pm EST on Friday, May 15 and I’ll randomly choose a winner from the list. Be sure your e-mail address is correct so I can contact you. 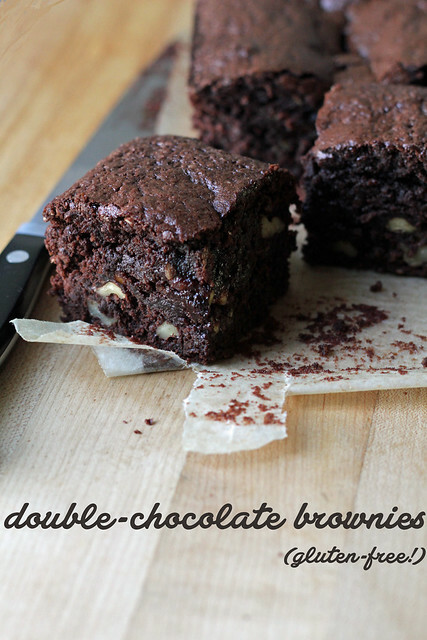 Gluten-Free Double-Chocolate Brownies and a BOOK GIVEAWAY! By no means do I follow a gluten-free diet (more like a gluten-full diet), but I know plenty of people who do, and I’ve had to do an increasing amount of gluten-free baking for customers at work. So I’m interested in it, even if I don’t do that much gluten-free baking at home, and was excited to see a copy of Gluten-Free Flour Power by Aki Kamozawa and Alex Talbot (from the very cool Ideas in Food) show up in my mailbox. They’ve developed gluten-free flour blends and devised recipes to use them that run the gamut of baking…breads, cookies, cakes, pies…heck, even kougin amann and cannelés! There’s pasta, dumplings, steamed buns and Japanese fried chicken, too. Flipping through my new book, I fixated on a brownie that’s made gluten-free, not with a blend, but simply with the use of oat flour. When it comes to brownies, I’m not loyal to any one recipe. I play the field and always seem to be trying a different recipe out. Oatmeal-chocolate chip cookies are a favorite of mine, and I knew I’d like a bit of that wholesome flavor in brownie-form. You can buy oat flour at most stores or make it yourself by blitzing old-fashioned rolled oats in your food processor, blender or spice grinder. I use oat flour often for whole-grain pancakes and when I need it, I usually go the homemade route because it’s something that’s a lot cheaper to DIY (and it’s quick and easy). Just make sure the flour or the oats you buy are certified gluten-free if you also want your brownies to be. These brownies use melted chocolate and a healthy amount of natural cocoa powder, so they really fix a chocolate craving. They’re tall and kind of straddle the line of being a little cakey on the edge and fudgy in the middle (I’m assuming this structure comes from having 6 eggs in the batter). And yeah, I could taste the oats, but no, I didn’t mind one bit. They’re delicious. A scoop of coffee ice cream on the side is delicious, too. The kind folks at W.W. Norton sent me a copy of Gluten-Free Flour Power, and now I want to send a copy to one of you! Just leave me a comment (one per person, please) on this post before 5:00 pm EST on Sunday, March 29 and I’ll randomly choose a winner from the list. Be sure your e-mail address is correct so I can contact you. Steph’s Note: If you grind your own oat flour and are using cup measures, grind more than you think you’ll need and measure again after. You can save any extra to add to other recipes. Also, nuts were not included in the original recipe, but I like them in brownies and added them to mine. – Put the chocolate and butter in a microwave-safe bowl and microwave in 30 second increments, stirring between each until melted and smooth. It should take about 2 minutes total. You can do this in a double boiler on the stovetop if you prefer. Let the mixture cool. –Put the oat flour, sugar, cocoa and salt in a medium bowl and whisk to blend. Add the chocolate/butter mixture and whisk to blend. Add the eggs, one by one, stirring in each well with a rubber spatula before adding the next. If using nuts, fold them in now. Once all ingredients are incorporated, give the batter another 20-25 strokes to insure the batter is well-blended. – Spread batter evenly into the prepared pan. Bake for 40-45 minutes, until the brownies are just set in the center. They should feel firm when gently pressed and they will not jiggle if you shake the pan. I realized not long ago that the end of this month marks the 8-year anniversary of my little space on the Web. What?!? That’s a pretty long time…certainly longer than I ever thought I’d keep this up. To celebrate not throwing in the towel years ago, I decided to treat this blog to a new header and I got in touch with Alyson, who helped me the last time. Do you like it? I think she incorporated the best parts of my much-loved old one in with the new. I have something for you, too….because where would a whisk and a spoon be without you? 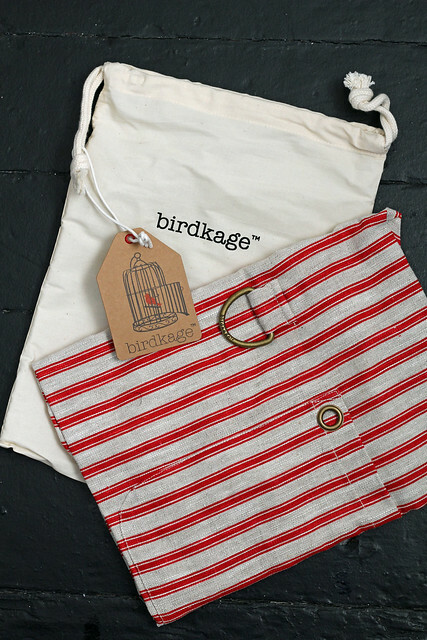 Actually, I have two somethings to share– two bib aprons in red and oatmeal striped linen from NYC-based Birdkage to giveaway to two readers. Let’s bake clean and cute! Cookies for Kids’ Cancer GIVEAWAY! 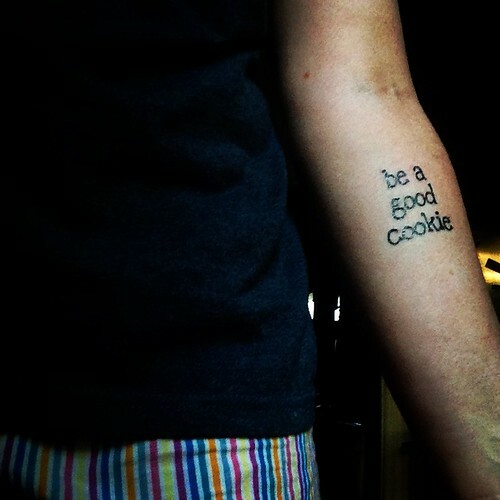 Be a good cookie. That’s a real motto for life, don’t you think? It was also the message behind an event for Cookies for Kids’ Cancer that the good folks at OXO, their strong partner and supporter of good cookies, and the lovely Dorie Greenspan invited me to last Tuesday night. I was thrilled to chat with Dorie (she also gave a baking demo), to flip through her amazing new book, Baking Chez Moi (which is coming out next month– get it! ), to drool over OXO’s awesome Chelsea test kitchen and to fiddle with some of their latest baking gadgets (I went out the very next day and got myself a spiffy baker’s dusting wand). Most importantly I got to learn more about Cookies for Kids’ Cancer, which provides research grants to some of the nation’s leading pediatric cancer centers to advance the development of less toxic, more effective treatments for children battling cancer. 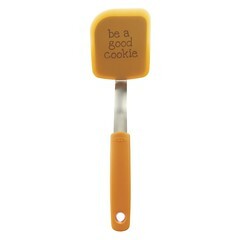 I want to do at least a small part to help spread the word about Cookies for Kids’ Cancer and Pediatric Cancer Awareness Month (that’s this month), so I’m going to give two lucky winners both an OXO Good Cookie Spatula and a copy of Gretchen Holt-Witt’s book Cookies for Kids’ Cancer: All the Good Cookies! The sale of both these items helps raise money for pediatric cancer research. You can see heaps of photos from Tuesday’s event here. 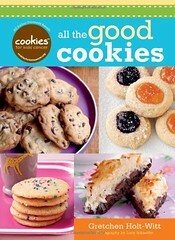 Visit the Cookies for Kids’ Cancer site to learn more about the organization and to get involved. Also, if you’re looking for some new kitchen toys (like a baker’s dusting wand, perhaps? ), OXO will make a donation to the initiative from the sales of select baking items. Confetti Layer Cake and a BOOK GIVEAWAY! Sometimes I just want a piece of birthday cake…even if it’s no one’s birthday. Know how that is? I do feel I’m embarrassingly late to the imaginary party with this confetti cake. I don’t even know if I’ve ever had the Pillsbury version. And it seems everyone’s made a homemade one but me (till now). What I thought was some magical secret to the colored bursts of confetti is really just jimmies stirred into cake batter. A cute book called Sprinkles!, which helps turn all things sparkly or rainbow-colored, showed me that. My own sprinkles collection borders on the absurd. Apparently I really needed this book– I’m filing it in the “self-help” section of my bookshelf. Back to the cake! The base here is a delicate white cake flavored with almond extract, although it would be also great flavored with lemon, so I included that as an option. The sprinkles folded into the batter explode in the in oven (not in a dangerous way, I promise!) into little pops of color scattered throughout each slice. I think any frosting you like with white cake would work well here, so use your favorite. I made an American-style powdered sugar buttercream with a blob of cream cheese added in to temper the sweetness just a bit. 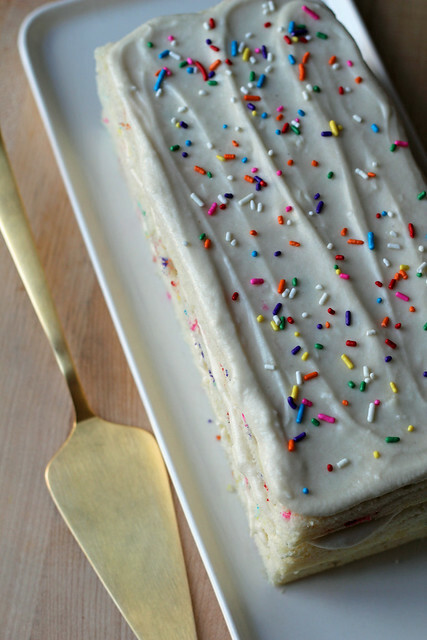 The sides of the cake are exposed to show off the fun inside, and don’t forget the extra sprinkles on top! The kind folks at Quirk Books sent me a copy of Sprinkles!, and now I want to jazz up your baking by sending a copy to one of you. Just leave me a comment (one per person, please) on this post before 4:00 pm EST on Tuesday, March 18 and I’ll randomly choose a winner from the list. Be sure your e-mail address is correct so I can contact you if you’re chosen. Steph’s Note: Obviously I didn’t bake my cake in 9-inch rounds. I scaled it back to a third and baked it as a quarter-sheet (adjusting baking time accordingly), which I then cut into three strips and frosted. -Preheat oven to 350°F. Line three 9-inch round cake pans with parchment circles, grease, then dust with flour. -In a medium bowl, stir milk, egg whites, applesauce or yogurt and extracts. Into another bowl, sift together flour, baking powder and salt. -Beat butter and sugar with an electric mixer on medium speed until light and fluffy, about 5 minutes. Reduce speed to low; add flour and milk mixtures alternately, starting and ending with the flour. Fold in the 1/2 cup sprinkles. -Divide batter among pans. Bake until a tester inserted in the centers comes out clean, 25 to 30 minutes. -Cool cakes in pans set on wire racks for 5 minutes. Run a knife around the sides of each pan, then invert cakes onto a cutting board. 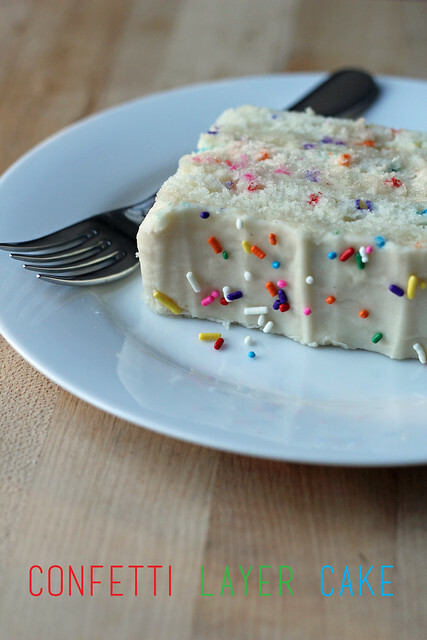 With a serrated knife, carefully cut off the tops and “crusts,” exposing the confetti sprinkles (this is optional). -Place first layer on a plate. Spread 3/4 cup frosting evenly over top. Repeat with second and third layers, leaving the sides exposed. Decorate the perimeter of the top with the remaining jimmies. Serve, or refrigerate up to 3 days. 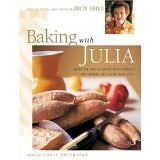 Baking with Julia BOOK GIVEAWAY! Next month, Tuesdays with Dorie is diving full-force into Baking with Julia by Dorie Greenspan. Have you signed up? If not having the book is keeping you from getting onboard, then I want to help. I’m giving away one brand-new copy of Baking with Julia before the group gets going with the first two recipes. Just leave me a comment (one per person, please) on this post before 5:00 pm EST on Monday, January 23 and I’ll randomly choose a winner from the list. Be sure your e-mail address is correct so I can contact you!